Supple tires are the most dramatic change you can make to the feel and performance of your bike. They roll more smoothly over the irregularities of the road surface, making them more comfortable and faster. They also absorb less energy as they deform with each tire revolution, which further increases your speed. Most of all, supple tires make your bike feel alive. 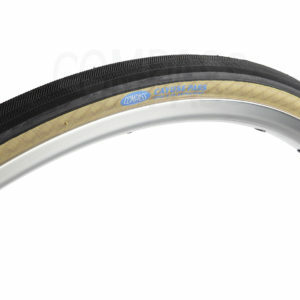 Our Rene Herse tires provide the amazing ride of high-end tubular tires, but with the convenience of clinchers: There is no need to glue tires onto your rims any longer to experience the wonderful ride of supple tires. Thanks to their wider sections and lower pressures, Compass tires roll over debris that gets hammered into narrower tires, making them remarkably puncture-resistant. The tread is thick enough in the center to make our tires long-lasting. The tread pattern is designed to interlock with the road surface, so our tires offer amazing cornering grip, both in wet and dry conditions. Rene Herse tires are available in a variety of sizes to fit most bikes. Once you ride them, you won’t be able to go back to 'normal' tires!